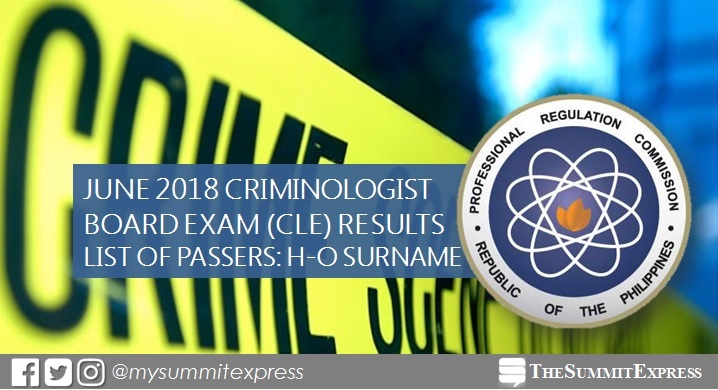 MANILA, Philippines – (Updated June 29) The June 2018 Criminologist board exam or Criminology Licensure Exam (CLE) result, together with the full list of passers, top 10 (topnotchers) and performance of schools are out on Friday, June 29, 2018 or in twelve (12) working days. As announced, 7,307 out of 21,894 passed the exams. The Professional Regulation Commission (PRC) and the Board of Criminology conducted the CLE on June 10, 11 and 12 (Sunday to Tuesday) in Manila, All Regional Offices and Zamboanga. View on this page for H-O list of passers, as announced online. PRC said that registration for the issuance of Professional Identification Card (ID) and Certificate of Registration will be done on-line. Visit the official website of PRC (www.prc.gov.ph) and follow instructions for initial registration. The successful examinees should personally register and sign in the Roster of Registered Professionals. According to PRC Resolution No. 2017-1068, the Criminologist board exam result is out on Friday, June 29 or in 12 working days after the tests. However, results may be released ahead of the target or on later date without prior notice. From time-to-time, monitor updates on release of results and other announcements on The Summit Express. Our partner exam results portal PRC Board News will also have a dedicated page for the recent Crim board exam. You may also visit the official website of PRC (prc.gov.ph) for more information.